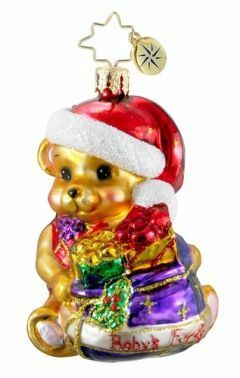 One of the most adorable teddy bear kids ornaments in the Russell Rhodes collection, the Christmas cheer Radko little gem ornament will delights little ones and their parents too. It's handcrafted from the finest European blown glass and hand painted in bright, holiday colors. "Baby's First" is lettered onto the Radko Christmas cheer teddy bear ornament to celebrate the first Christmas with a new baby as part of the festivities. We'll be happy to package it in the attractive and sturdy Radko gift box at your direction.